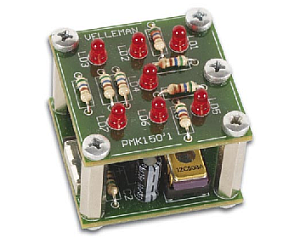 This innovative kit is a microprocessor controlled circuit that acts like a real dice if you give it a shake. It rolls out slowly and flashes the last combination or winning number. The kit is constructed around a preprogrammed 8-pin PIC microcontroller (12c508A). It has auto power on/off and runs on one 3V Lithium button cell (not included).